I really like Stevia. In fact, I love the idea of Stevia as an all-natural sweetener so much that I even tried growing a Stevia plant in high-desert country at 5200 miles above sea level (lamentably, Stevia is a tropical plant. Sorry, Colorado). Unfortunately, the taste of Stevia alone is really hard for me. As a supertaster, I can’t handle the over-sweet/almost nasty natural option. Even in leaf form, the plant bordered on the bitter. As such, I typically either have to go without the sweetener altogether, or I have to look for blend options that allows the sweetness minus the earnestness. A girl has to accessorize, you know. I have to applaud a company like Hey Shuga! for making the effort to work Stevia into a product that can be used for so many things without all of the guesswork–especially where you typically use honey or maple syrup in recipes. I put that important phrase into italics, because it’s important–and you’ll soon see why (aren’t I all suspense-y?). Because of the Stevia, you only need 1/2 of the amount you might typically need. It’s a good thing, too, considering the carbohydrate count for each 1/2 of a teaspoon. A quarter cup of Lil’ Sugah delivers 72 net carbohydrates, but thankfully, it has the same sweetening power as 1/2 of a cup of sugar since it’s twice as strong. This means the sweetener becomes slightly more amenable in terms of carbohydrate content, especially when compared to 1/2 cup maple syrup (216 carbohydrates) or 1/2 cup honey (139 carbs per half of a cup). And because of its concentrated state, you don’t have to make up for the addition of viscous liquid in recipes as you would typical maple syrups or honey. I have to admit, I wasn’t quite prepared for how lip curlingly sweet this product is, but knowing that it’s 2 times stronger than typical teaspoon-per-teaspoon sweeteners makes this a more natural product that contains fewer carbohydrates than maple syrup, agave or honey. Not to mention that the cute glass jug is just about as sweet as what’s inside. Who benefits: Those using maple syrup or honey in baking will like the concentration and lower glycemic load. Love: The blending of a syrup with stevia for a concentrated product means you use less. 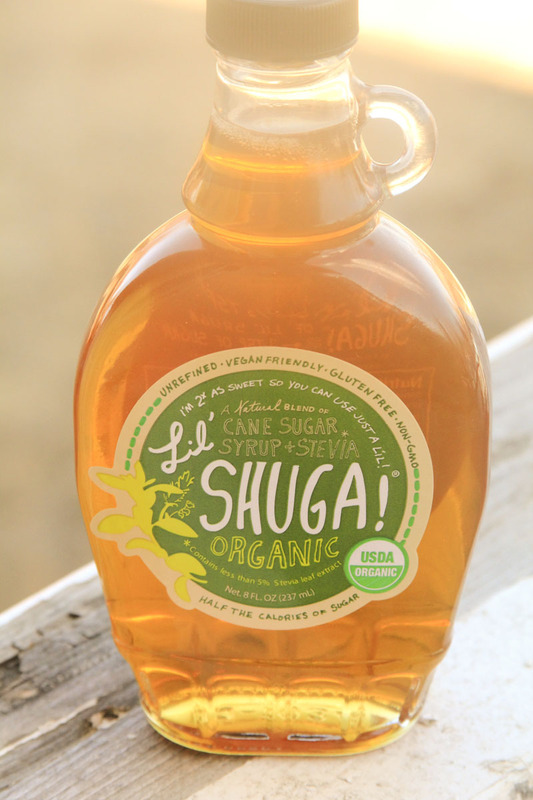 Negative: Organic cane sugar syrup is still pretty carby if you typically use other sugar-free sweeteners. Disclosure: Hey Shuga has provided this product free of charge for review, but this has not affected my review of the item. I am not following how you calculated the carbs per 1/4 cup? Your text states there are 1 net carbs per 1/2 tsp. 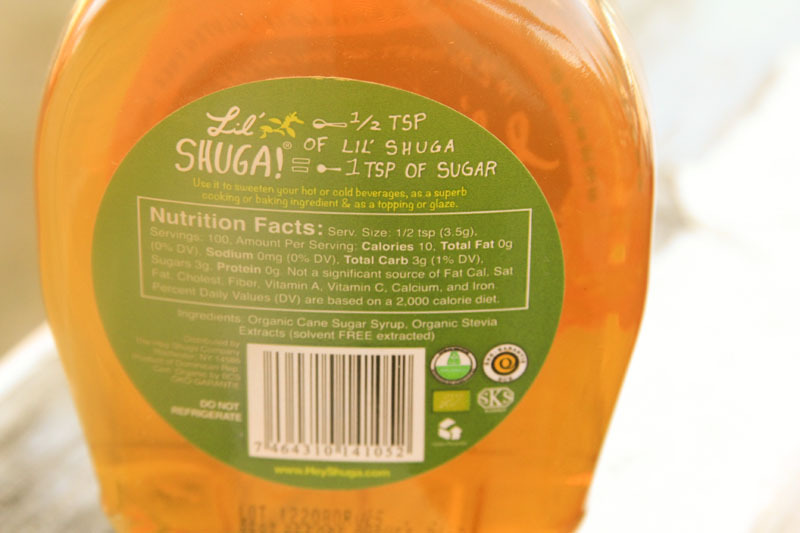 of Lil’ Shuga, however looking at your picture of the label, it clearly states there are 3 carbs per 1/2 tsp. With no fiber to subtract, that means it is definitely 3 carbs per 1/2 tsp. With 12 teaspoons in 1/4 cup, this would have a whopping 72 carbs per 1/4 cup. Am I missing something??? Hi, Gina! You are right! I thought it was a carb, but I misread the label. Making the changes now. Thanks so much! The label on the website is different than the one on the bottle that you have. The website has 1/3 tsp = 1 tsp of sugar @ 1 carb per serving. That’s where your miscalculation came from. Whew! I was thinking I was going silly for a moment. Thank you!